Welcome to our site on the Canadian Football League's ill-fated attempt to establish franchises in the United States. Though the CFL's American entries did not last long, they left many memories to those who watched them play. Following the demise of the United States Football League in 1985 and the World League of American Football's presence in the US in 1992, America was left without an outdoor alternative to the NFL. The financially-strapped Canadian Football League decided that they would step into the void. The league established outposts from Sacramento, California to Baltimore, Maryland and as far south as San Antonio, Texas. 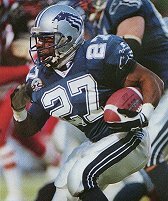 Several of the CFL's best players including David Archer, Mike Pringle, Matt Dunigan and Tracy Ham landed on American teams, giving the new teams plenty of talent. The Baltimore club battled in two Grey Cup championship games and is the only non-Canadian club to win the coveted prize. CFL expansion into the country was the brainchild of former Commissioner Larry Smith. He envisioned a Canadian League with up to 24 teams, including 8 to 10 teams in American cities, and new teams for Montreal and the Maritimes as well by 1998. Unfortunately, America's CFL entries struggled financially, forcing the CFL to withdraw from the US as quickly as it had entered. Though Smith's idea ultimately proved to be unsuccessful, for three seasons these teams played the distinct game of Canadian football on American soil. This is their story. The American flag maple leaf logo was created by Paul Reeths for this site and was never used by the league.